I saw this hawk as well as a couple of others. They were not visible during the warmer months but they appear to have finally returned! Temps in the upper 60's, cloudy and overcast, steady breeze. Fairly cool day for a hike. I didn't start until 10:00 and was surprised to see a feral cat on the nortern end of Tasajilla Flats and about 1/2 mile further on the Nature Loop, I saw a bobcat walking away from me. 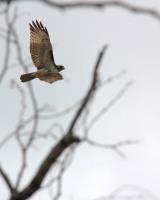 Birds were all over the place and I'm seeing more hawks out and about. I also saw four moutain bikers which also surprised me. All in all a nice day to go for a hike. Water, shade, info kiosk and dry toilets available at Burkett park - if you follow my route you will visit Burkett park twice.